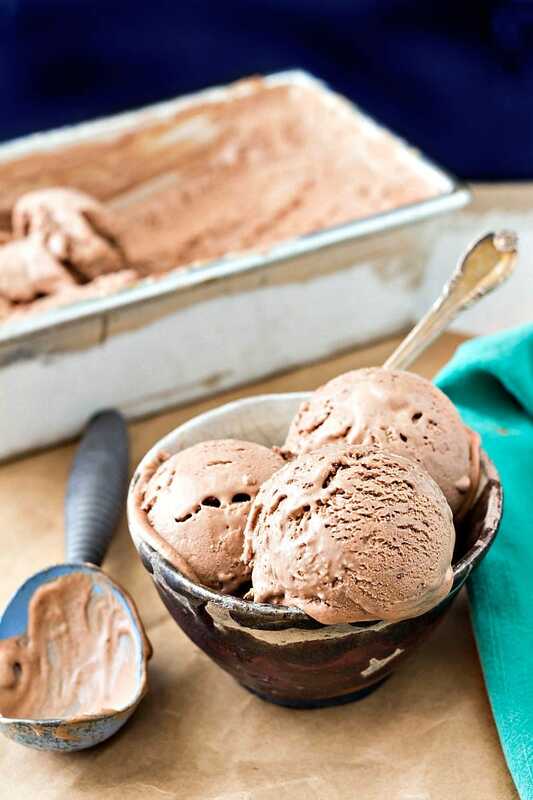 This chocolate caramel ice cream is the best chocolate ice cream you’ll ever have. The caramel base adds a lot of complexity without taking over. Let’s make some, shall we? As someone who develops recipes and tries to stand out from the crowd a bit, one of my most difficult tasks is to come up with foods that are both familiar and push the boundaries just a bit. Many people who search the Internet for recipes are not looking for some rarefied pastry that took me three days to make. They’re looking for good food to feed their family or their guests or their church group at a pot luck. 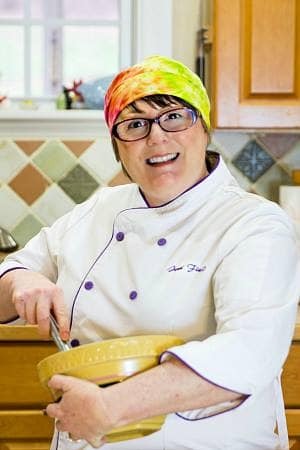 I love creating food that is more on the gourmet end of the spectrum, but I also want people to find me, Pin my recipes and actually make them. And for that to happen, I must give them what they want. Fortunately, I can give people what they want as well as going sort of gourmet with this ice cream. 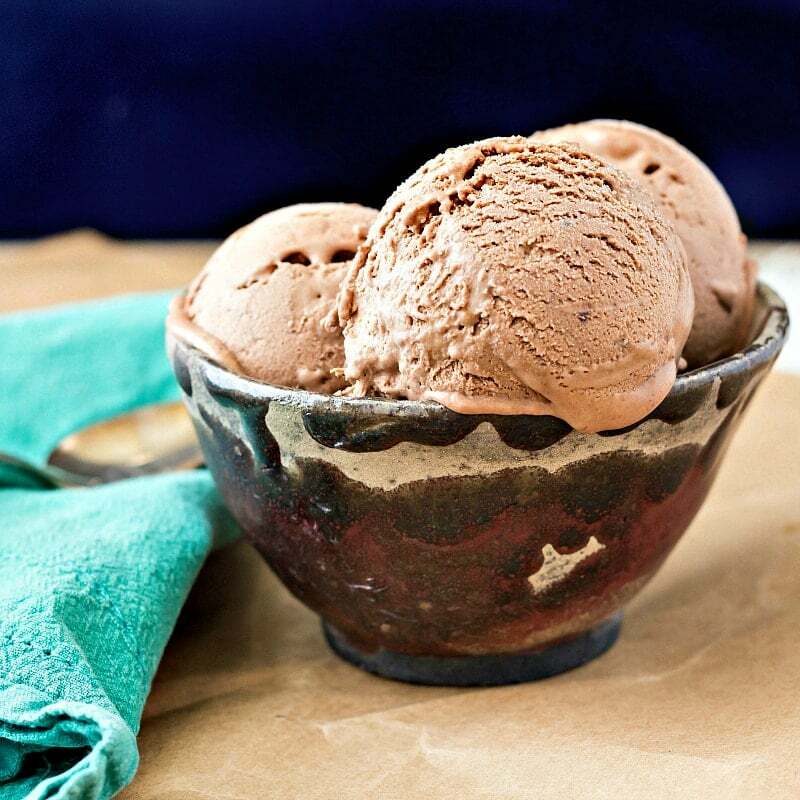 At its heart, this very fancy sounding ice cream is chocolate caramel ice cream. 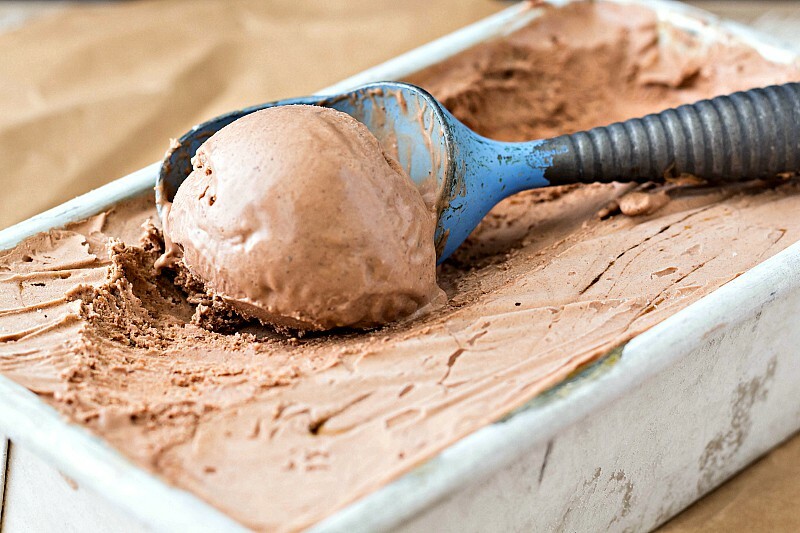 Chocolate ice cream made with a caramel base. Just like with the best hot fudge sauce in the world, caramelizing the base lends tons of complexity you just can’t get with a neutral or vanilla base. We discovered this at the restaurant when I was playing around with ice cream bases one day. That was one of the best days ever, because the chocolate caramel ice cream turned out to be everyone’s favorite. Starting with a caramel base for no-churn ice cream is easy. All you do is caramelize your can of sweetened condensed milk by submerging it in a pot and letting it boil for 1 1/2 hours. This amount of time yields a light caramel that is still pourable, and that’s exactly what I wanted. If you boil it for too long, it gets really dark and complex and so thick you can scoop it like butter. The downside of that is you have to add more liquid to make sure the ice cream sets up. At an hour and a half, you’ve developed some complex flavors but haven’t gotten rid of so much liquid that the ice cream won’t freeze. Lovely! I fancied up my chocolate caramel ice cream by layering in some lovely fig vanilla spread I found at BJ’s one time. Since figs are friends with both chocolate and caramel, it is a match made in heaven. And breaking up the rich smooth texture with the occasional fig seed adds just a hint of crunch without being in your face. I think it is just about perfect. If you are not a fan of figs, swirl in almost anything your heart desires. The key to making a swirl in ice cream isn’t actually swirling anything. It’s about layering the base with whatever you’re swirling. I usually do four layers of base interspersed with 3 layers of swirl. Once I’m finished, I might do a quick swirl with a knife, but you don’t even really have to do that. When you scoop your ice cream, you’ll get swirls and stripes of your jam or whatever you’re using. Nice! Enough talking. Let’s do this. 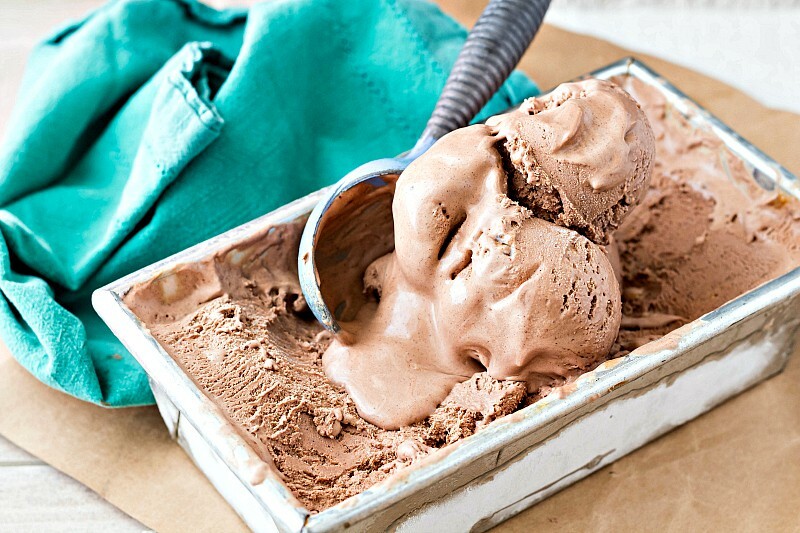 Let’s make some Chocolate Caramel Ice Cream and then swirl in whatever we want. 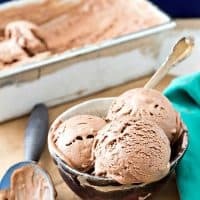 There are a few steps to making this chocolate caramel ice cream, but it is no churn and only has 6 ingredients. It is definitely worth the little bit of extra work to make this gorgeous ice cream. This chocolate caramel ice cream is the best chocolate ice cream ever. It's no-churn, and you have the option to gussy it up like I did with a fig swirl, or any swirl your heart desires! Put the can of sweetened condensed milk in a large pot and fill with water so it's covered by about an inch. Bring to a boil, partially cover the pot, and reduce the heat to maintain a low boil. Boil for 1 1/2 hours. Remove the can from the water using tongs and let sit out at room temperature to cool until just warm. Place the chocolate chips or chopped chocolate in a heat-proof bowl. Combine the heavy cream and cocoa powder in a sauce pan. Over medium heat, whisk until the cocoa powder is all mixed in with the cream. Heat until steaming it reaches a bare simmer, whisking occasionally. Pour the cream over the chocolate and let sit a minute. Whisk until the chocolate is melted.and smooth. Whisk in the caramelized sweetened condensed milk, vanilla and salt and chill until cold. Pour the base in your mixer bowl. Attach the whisk attachment and whisk until the base is about the consistency of thick cake batter or very soft peaks. Pour into your freezer-safe container. Press plastic wrap down on the surface of the ice cream and freeze for at least 8 hours before scooping and enjoying. Layer in 1/4 of the whipped base and top with about 3 tablespoons of fig jam or spread of your choice. Repeat with 3 more layers of whipped base and 2 more layers of jam. Run a knife through the ice cream a few times if you want. Press plastic wrap directly on the surface of the ice cream and freeze at least 8 hours before scooping. Whether you make this chocolate caramel ice cream plain or add in layers of jammy goodness, I really hope you make it. You will be amazed at how much the caramel base boosts the chocolate. So good! I love these Chicago Metallic loaf pans for ice cream. Click on the photo for an affiliate link to grab a couple for yourself! One note: while this ice cream is ridiculously good, it is also very rich. If you decide to pour sauce over it, I would not use the richest sauce in the world. It might be a little bit too much. And there you have it. Either the best chocolate ice cream you will ever eat or the fanciest chocolate ice cream you will ever eat. Either way, you can’t lose! Thanks for spending some time with me today. Enjoy the chocolate caramel ice cream (with or without the fig swirl), and have a lovely day. What would you like to do now? Click NEXT to explore my other ice cream recipes.